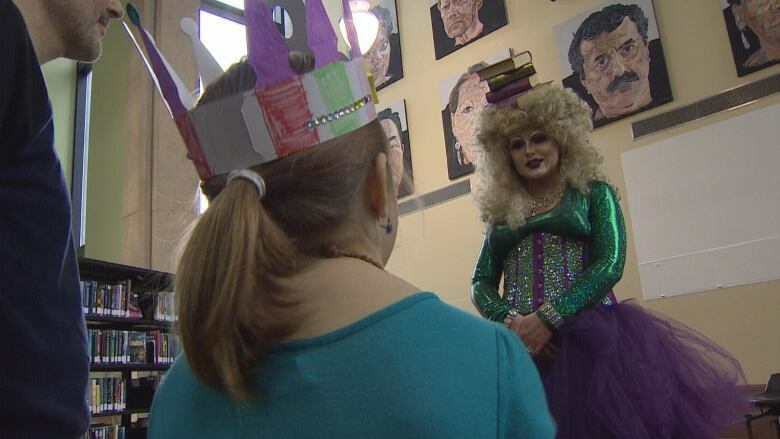 It was a March Break storytime with a twist at the Confederation Centre Library in Charlottetown as more than 80 people attended the first ever Drag Queen Story Time, featuring special guest Whatshername. "I think my favourite moment was walking out because this is the first time for Prince Edward Island, for many of these kids and for many of the grown-ups that they're seeing a drag queen for the very first time," said Nicholas Whalen, a.k.a. Whatshername. "That's pretty powerful not only for me but for the people experiencing it." Drag queens reading to kids became a trend a couple of years ago in San Francisco. "I'd never been to a Drag Queen Story Time myself," said Whalen. "But you know as a little boy how great would it have been for me to have gone to something like this and it would have made a big difference in my life." Whalen read from two LGBTQ-positive books — King and King and Morris Micklewhite and the Tangerine Dress. "There's something in each of these stories for every kind of kid and every kind of family so I have no doubt that everyone left with something from it," Whalen said. Librarians at the Confederation Centre were excited when Whalen approached them about hosting a Drag Queen Story Time. 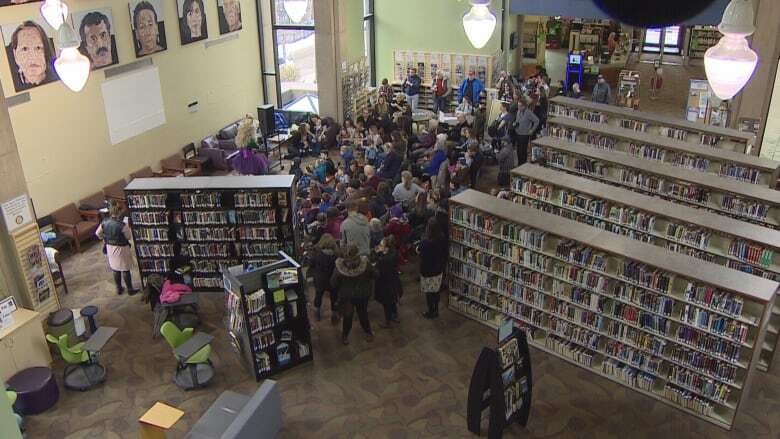 "We've seen that happening in other places and thought it would be really interesting to try here," said Roseanne Gauthier, youth services librarian for the P.E.I. Public Library Service. "We're also looking for ways to promote diversity and inclusion in our family programming but we really wanted to wait until we found the right person and Nicholas and Whatshername were the perfect match for us." Besides the stories, Whalen also performed two lip synch songs, with special lyrics about celebrating books and reading. "I think one of the biggest reasons they've been so successful is they're a lot of fun," Gauthier said. "There's a lot of singing, there's a lot of dancing, some really great books are being shared which of course is something that's very important to us in the library." Gauthier was excited for an opportunity to showcase the many books promoting the messages of diversity and inclusion and acceptance. "This is an area where we've been seeing a huge increase in the number of materials that are being published," Gauthier said. "It's even easier for kids to come into the library from all different backgrounds and all different types of families and to see themselves and to see their families in the books that they can take home." Gauthier admits there were a few negative reactions to the event. "There's been a bit but mostly positive," she said. "We're hoping that anyone that had any concerns is going to see that this is a fun family event and that everybody has a good time and walks away with a positive message." "I thought it was amazing because it really opens your eyes, said Mallory Grant, 12. "It was hilarious, I loved it." The message she's taking away? "Not to judge because everyone has their own story." Kieran Keller brought his two daughters, Ruby and Clara, to the Drag Queen Story Time. "I thought why not be exposed to something that they haven't seen before, this is just one of those things that we should see," Keller said. Ruby said her favourite part was hearing Whatshername read Morris Micklewhite and the Tangerine Dress. "That a boy can wear a dress even if he's a boy, you can be anyone you want," she said. "I think she got the message even better than I did," said her father. "It's so simple for kids, it's really clear." The library staff was thrilled by the reaction. "It was amazing," said Gauthier. "My face actually hurts from smiling right now." Whatshername and library staff are already talking about future Drag Queen Story Time events at other libraries across Prince Edward Island.